Over the last 12 years we have executed the on-time and within budget completion of 12 new schools and 12 school/classroom expansions. Our average change order rate for all construction projects is commendably less than 2%. 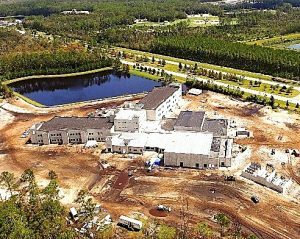 The two new K-8 Schools currently under construction in the Nocatee (“KK”) and Aberdeen (“LL”) areas are scheduled to open for the 2018-2019 school year. The approval of the half-cent sales surtax initiative has fully funded the construction of K-8 School “LL” and partially funded the construction of K-8 School “KK”. “Topping Out” ceremonies were recently held at each site to celebrate the construction progress thus far. Together both schools will provide 2,992 additional student stations to the District when complete.